It's been the thing that got me through some tough times, and it probably will be in the future. I'm safe in my imaginary world and I get to write stuff down and read it again, because it's fun like that. But I do have other things I love doing, other hobbies, and hobbies are important to break up the monotony and loneliness of writing. My favorite hobbies are knitting, embroidery, sewing, costuming, music, gaming, politics, and reading. 1. Reading-- because reading is really cool. Stephen King says, "If you don't have time to read, you don't have time to write." And it's true. I get inspired when I read and start coming up with new ideas. 2. Costuming/sewing-- because what's cooler than making someone into something they weren't before? And I love the theatre. It's so fun, especially backstage. That's where all the fun happens. 3. Music-- luckily, I live in Music City USA, better known as Nashville. No, we aren't just country and honky tonk. A lot of hit musicians live here, and it's not abnormal to run into them, not just country stars. Any given night, if you know the right places to look, you can find a concert going on, and it's usually pretty good music. Indie music is a big deal. 4. Gaming-- I admit it. I'm a noob to gaming, but it's fun. My favorite games so far are Elder Sign and Cards Against Humanity. I also play bar trivia with Geeks Who Drink every Sunday night. 5. Knitting-- fun, but I always end up dropping stitches, darnit! 6. Embroidery-- this is my adult coloring book. 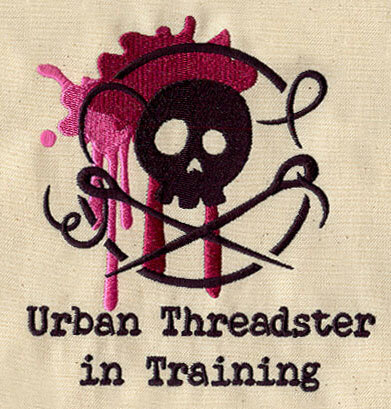 Urban Threads is my favorite site for patterns! 7. Politics-- okay, not a great subject for this blog. So what do you like to do when it comes to hobbies?